Michael Caffee, Fe-Be's Leather David (1966), cast plaster sculpture with Fe-Be's plaque on base, GLBT Historical Society. This exhibition showcased drawings, paintings, and three-dimensional artworks that are part of the GLBT Historical Society’s Art & Artifacts collection. Curator Elisabeth Cornu selected artworks produced during one of the most tumultuous periods in the local LBGT liberation movement: the 1960s to the 1990s. Elisabeth Cornu is an independent museum specialist, and former head of objects conservation at Fine Arts Museums of San Francisco. She works as a museum studies advisor locally and internationally. 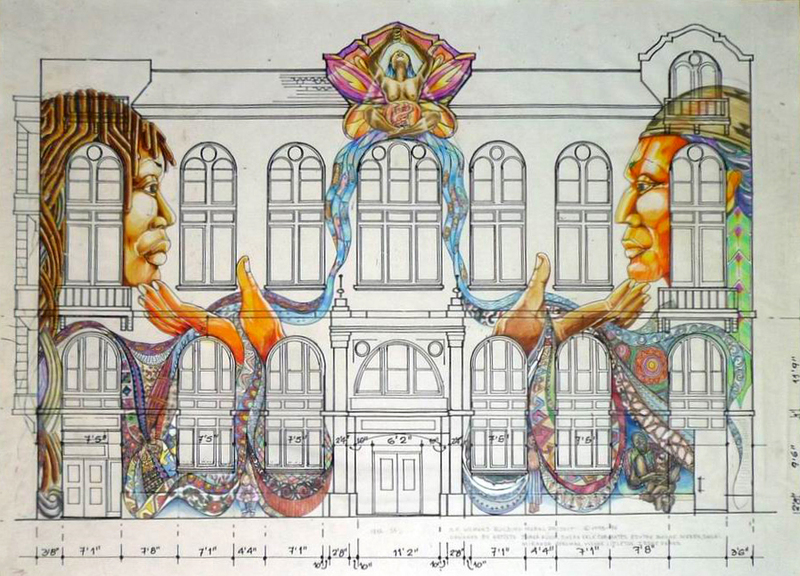 Juana Alicia, Miranda Bergman, Edythe Boone, Susan Kelk Cervantes, Meera Desai, Yvonne Littleton and Irene Perez, Drawing for Maestrapeace Mural, Women’s Building (ca. 1993), pen and ink with color pencil on blue print, GLBT Historical Society. Banner photo: Mike Cassidy, Interior of the Ambush Bar (1983), oil on canvas, GLBT Historical Society.